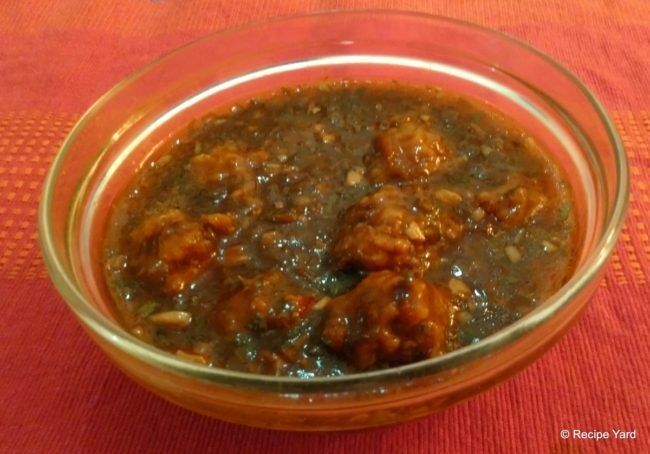 One of the most loved Indo-Chinese dish, this is an easy recipe to prepare restaurant style Vegetarian Manchurian at home. You can prepare it dry or with gravy. Dry Manchurian is usually served as an entrée or starter whereas Manchurian gravy is usually served with rice or noodles as a main course item. Note: To make dry Manchurian, just reduce the amount of sauce ingredients to half. Put a pot on medium-high heat with enough water in it to boil. To this, add all vegetables for dumplings except one quarter of cabbage and boil for 4 – 5 minutes or until tender. Strain out and transfer vegetables into a large mixing bowl. Reserve vegetable stock. Crush or mash the boiled vegetables using a potato masher and season with salt. Sprinkle with corn flour and mix well to combine. Then take small portions of this mixture and roll into small balls. Keep aside on a greased tray. Put a wok or skillet over medium heat with enough oil in it. Deep fry all vegetable dumplings in batches until brown. Strain out using slotted spatula and keep aside. Drain out most of the oil from the wok leaving just 1 tbsp in it. Add grated or finely chopped onion and sauté for 3 – 4 minutes or until lightly browned. Add in garlic cloves, stir and fry for a minute or until fragrant. Meanwhile, dissolve 2 tbsp of corn flour in 2 cups of vegetable stock. Also add soy sauce, and vinegar. Stir to mix all well then pour into the wok. Also chop reserved cabbage into very fine chunks. Stir and boil for a minute or until thickened. Add in fried vegetable dumplings and season with salt to taste. Stir and boil for another minute then add in chopped cabbage, chopped green onion and toasted sesame seeds. Stir and transfer into serving bowl. Serve hot with rice or noodles. Thank you Anjali for your valuable feedback. It is really encouraging for me to hear on my recipes. Please keep on giving your valuable comments on other recipes too. I am happy you liked it.